We tend to take our senses for granted. However, consider for a moment losing your sight or hearing. Imagine not being able to taste, touch or smell. The mere thought is both disturbing and, frankly, pretty terrifying. No matter how old you are, or where you live in this world, the potential loss of one (or more) of your senses is a truly frightening prospect. The universality of this fear goes some way to explain why so many filmmakers have chosen to explore sense loss - most recently, of course, in movies such as A Quiet Place and Netflix horror/thriller Bird Box. There is huge dramatic potential in the practical ramifications of such a life-changing scenario. How would we cope? Who could we trust? How would it feel to be so vulnerable, to lose control, to place our safety in the hands of another? What if that person were not all that he or she seemed? Recall Susy Hendrix (brilliantly played by Audrey Hepburn) in Terence Young’s classic 1967 thriller, Wait Until Dark. Her recent blindness is cruelly exploited by three dangerous criminals hellbent on finding a drug-filled doll in her flat. However, the scene where Susy’s young helper, Gloria (Julie Herrod), has a tantrum and ransacks her carefully designed apartment is just as horrific (perhaps even more so). Susy is so reliant on Gloria - she is almost unbearably vulnerable here. As this scene proves, the loss of a sense is frightening enough without the need for any extra scares. The body becomes its own haunted house. In addition, while the likelihood of being attacked by a hockey mask wearing, knife wielding madman is (I hope) slim, the loss of a sense is chillingly plausible. Add a (possibly knife wielding) baddie, a crazed monster or a fatal, contagious disease (like in Fernando Meirelles’s Blindness) and you’ve got yourself an extremely compelling story. From Susy Hendrix to Clarice Starling and beyond, countless horror films and thrillers have exploited our fear of the dark. Inspiring many a tension-fuelled scene, blindness enables filmmakers to explore a variety of unsettling ideas - for example, loss of control, vulnerability, deception and grief. Guillem Morales examines these themes in his 2010 film, Julia’s Eyes. Featuring a superb double performance from Belén Rueda, this horror mystery follows Julia in the days after her sister Sara’s death. The authorities believe that Sara committed suicide after the failure of an operation to correct her deteriorating sight. Julia, slowly going blind from the same condition, believes that Sara has been murdered and is convinced the killer is a shadowy figure that looms in and out of her vision. 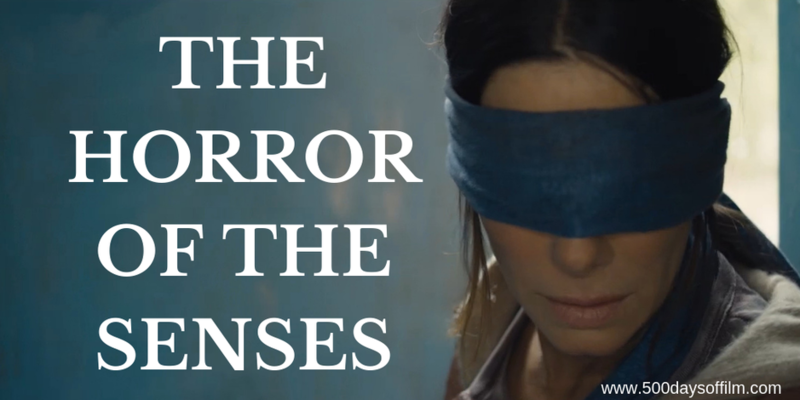 Morales conveys Julia’s declining sight in a series of anxiety-inducing scenes. Like Julia, we strain to identify what lurks in the darkest corners of every room. The director then switches perspective - making us all too aware of Julia’s vulnerability by showing us the dangers that she cannot see. Interestingly, cinema’s frequent portrayals of blindness have inspired some stunning and creative visuals. Directors and cinematographers utilize increasingly innovative techniques in order to give us a taste of what it could be like to lose our sight. Marc Forster’s film, All I See Is You, follows Gina (an impressive performance from Blake Lively) a young woman who has been blind since childhood and who then regains her sight. The impact her recovery has on her “perfect” marriage makes for a tense and engaging thriller. However, it is the film’s stunning depiction of Gina’s compromised vision that is most fascinating. In this gorgeous (almost painterly) movie, Forster and his director of photography, Matthias Koenigswieser, create a kaleidoscopic collage of images to depict what Gina can and cannot see. Colours are heightened as they shift in and out of focus - a visual language is developed to communicate Gina’s blindness. Meanwhile, sound also plays a key role - just as it does in Gina’s life. Indeed, sound is often used as a tool in films about blindness - a way to represent the theory that the loss of one sense leads to the enhancement of another. Creative soundscapes are also crucial in movies depicting deafness. For example, sound is enhanced and exploited in Mike Flanagan’s Netflix horror, Hush (a movie that was, incidentally, inspired by Wait Until Dark). The opening scenes of the film immerse us in sound - of birds singing, of wind blowing through the trees. Inside a cabin in the woods, a meal is being prepared. Every sound is magnified - from a cork being pulled out of a bottle to the chopping of an onion. The camera then pans in on a woman reading a recipe. As we move around her, the kitchen noise becomes muffled, less distinct. The same actions - the onion chopping, the boiling of rice, the roaring of the oven - are now silent and we realise that Maddie (played by Kate Siegel, who co-wrote the film’s script with Flanagan) is deaf. Maddie’s inability to hear is then used time and again to ramp up Hush’s horror and suspense. The camera moves constantly emphasising her predicament. Maddie cannot hear the terrible things that are taking place just outside her home… but we can. The ensuing tension is extremely effective. Also impressive is the fact that this 81 minute film plays almost like a silent movie - there is only approximately 15 minutes of dialogue. This highlights the themes of communication that run through Hush. Maddie cannot hear and she also cannot speak. Her hands are her only means of communication - something that does not go unnoticed by the psychopath at her window. While critically admired, Hush was criticised for not hiring a deaf actress to play Maddie. In addition, among other inconsistencies, deaf audiences noted that Maddie’s sign language changes from ASL (American Sign Language) to PSE (Pidgin Signed English). As a result, Millicent Simmonds’s casting as Regan in John Krasinski’s A Quiet Place was widely welcomed (not least because she taught the cast and crew how to sign). Screenwriters, Bryan Woods and Scott Beck, have talked about how Krasinski pushed for Simmonds to be hired. Thankfully, his determination was rewarded. The decision to cast a deaf actress to play Regan gives A Quiet Place added depth and authenticity (something that Millicent Simmonds also brings to Todd Haynes’s film, Wonderstruck). In A Quiet Place, Regan’s hearing loss empowers her family, enabling them to communicate and, ultimately, survive in a world full of savage monsters who hunt using sound. While Krasinski does not exploit Regan’s deafness for cheap scares, there are moments when she is very vulnerable indeed. Out of our five senses, sight and hearing are explored the most in cinema. However, taste, touch and smell are also portrayed in film. For example, David Mackenzie’s 2011 movie, Perfect Sense, takes place in the near future after a mysterious virus begins to attack the human race. Victims are beset by an overwhelming sense of grief, followed by a complete loss of smell. Other senses also start to fail. The idea behind Mackenzie’s film is interesting - what senses could we live without? What senses would, if they were lost, make life unbearable? Perfect Sense paints a bleak picture. Thankfully, many films - including Wait Until Dark, A Quiet Place, Hush and Julia’s Eyes - seek to tell more entertaining, often inspiring survival stories. For example, both Susy and Julia fight back by using their ability to navigate the dark. In addition, Gina, Maddie and Regan use their other, heightened senses to stay one step ahead of their respective monsters. Films such as these explore the human condition, while also using the loss of sight, sound, taste, touch and smell as a way to examine our most basic and universal fears. Little wonder, then, that cinema is full of stories exploring sense loss.